Breaded mozzarella sticks, served with delicious marinara sauce. Spinach, artichoke heart, garlic cream cheese,sou cream and bacon blended with Mozzarella cheese and a creamy Parmesan cheese served with sour dough dippers. A basket of seasoned Peoples corn Chips served with our own homemade picante sauce. Add Queso dip $5.99. Fresh button mushrooms lightly covered with seasoned bread crumbs and fried to a golden crisp,served with ranch dip. Each order breaded to order, deep fried and served with our house dressing. 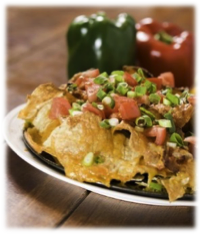 We load our crispy, fried potato skins with bacon bits, green onions and melted cheddar cheese. We have painstakingly removed all onion breath from the entire basket of onion rings. So eat up with your favorite bottle of ketchup. A perfect sampler platter of our homemade fried mushrooms,delicious potato skins, and a cheese sticks served with our homemade dipping sauce. Lightly dusted and deep fried Calamari rings are served with made from scratch tarter or cocktail sauce. Jumbo shrimp wrapped in a crispy rice breading and served with our special citrus sauce.